We make our own way to Glasgow, where our holiday begins with an introductory walk, dinner and overnight stay in a central hotel. Next morning, we drive along iconic Loch Lomond to enter the Highlands en route to the Hebrides. We sail from Oban to the island of Mull for a three night stay at the 4-star Isle of Mull Hotel, with pool and spa facilities, in a wonderful coastal location. Day two will be spent exploring Iona including our own service in the Abbey. 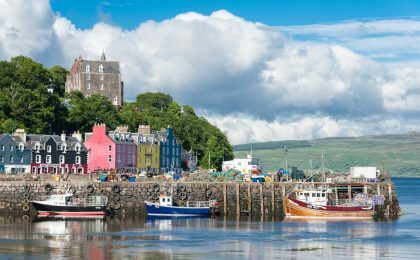 On the third day we will visit colourful Tobermory and have the option (weather permitting) of sailing to Fingal’s Cave on the island of Staffa. On the final day we leave Mull in the morning, arriving back in Glasgow mid-afternoon in time for train connections home. We have designed our short break holidays to be inexpensive, packed with interest and pilgrimage based. This is an opportunity to meet up with pilgrims from previous experiences. Independent travel to Glasgow with check in from 3:00pm onwards at the Radisson Blu Hotel (or similar), within walking distance of Glasgow Central Station. We will arrange an introductory walk around the city for early arrivals. Welcome reception, dinner and overnight at the hotel . A two hour drive takes through magnificent scenery along the western shore of Loch Lomond and then Loch Awe to Oban, gateway to the isles. We will enjoy a cruise on Loch Lomond and break for a light lunch in Tyndrum (not included). We continue to Oban for the ferry crossing to Mull which takes less than an hour. We plan to arrive at the Isle of Mull hotel, our home for three nights, at around 17:00. On our sea crossings, we will try to spot dolphins, whales and basking sharks, regular visitors to these shores. This morning we visit the picture-postcard fishing port of Tobermory. We will stop to observe a seal colony and keep a lookout for sea eagles, otters and porpoises all of which are common on Mull. A picnic lunch is included today. 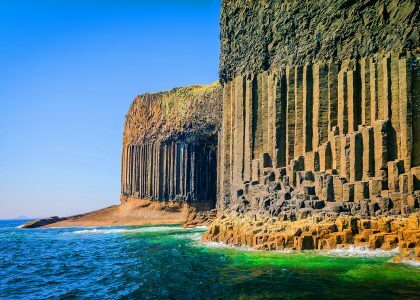 This afternoon choose an optional excursion to the island of Staffa, where Fingal’s Cave was the inspiration for Mendelsson’s symphony, The Hebrides. We have kept this optional as the boat is small and really best in good weather. Non-sailors return to the hotel for a free afternoon. We take a ninety minute drive to Fionnphort for the ten minute crossing to Iona where we will join a service of worship in Iona Abbey. A picnic lunch is included today. The rest of our day on the island will include a pilgrimage walk around the significant places in the life of St Columba as well as visiting the ruins of The Nunnery. We leave Mull and sail back to Oban and take a scenic route back to Glasgow. We plan to arrive back in Glasgow by 15:00. We recommend booking connections home anytime from 16:00. On Day 3 in the afternoon from 14:00 to 17:30 we offer an excursion by small boat to Staffa, home to basalt pillared Fingal’s Cave and inspiration for Mendelssohn’s overture The Hebrides. 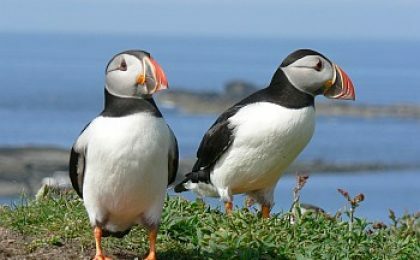 One hour is spent ashore (weather permitting) with the opportunity to explore the cave and island, which is a major puffin breeding colony. There should still be some ashore in June. Please note that there is often a swell making landing a bit difficult. Access to Fingal’s cave is easy but exploring the island involves climbing a steep staircase. This said, the trip is highly recommended. The cost of this holiday is £695 with pretty much everything included, except your travel to Glasgow. 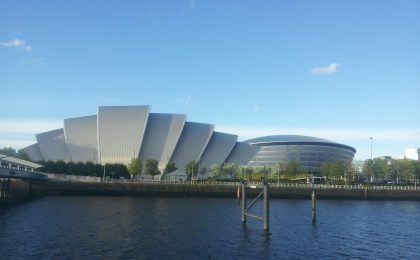 We have chosen Glasgow as the ideal starting point and we will have a welcome reception and dinner together on our first night at the Radisson Blu Hotel very near Central Station. Our next three nights are at the Isle of Mull Hotel, in a great location on the seashore in the village of Craignure. All Lower Ground rooms have private facilities and views of the gardens leading to the sea. Ground Sea View rooms have the best sea views in the hotel—some of the best in Mull, and we can request these for a £30 per person supplement. To request these, mark your booking form SEA VIEW in the special requests box. Travel to Glasgow is not included. Train is possibly easiest with our first night hotel walking distance from Central station. We recommend booking rail tickets online from www.thetrainline.com or similar. The cheapest tickets are usually released 12 weeks prior to travel. There is a system you can sign up to where the web site will alert you when the cheapest fares first appear. On Saturday afternoon from 14:00 to 17:30 we offer an excursion by small boat to Staffa, home to basalt pillared Fingal’s Cave and inspiration for Mendelssohn’s overture The Hebrides. One hour is spent ashore (weather permitting) with the opportunity to explore the cave and island, which is a major puffin breeding colony. There should still be some ashore in June. Please note that there is often a swell making landing a bit difficult. Access to Fingal’s cave is easy but exploring the island involves climbing a steep staircase. We are travelling to Alistair McCabe’s part of the world, where his family holiday every summer. Boats feature strongly in our programme and are a lot of fun. 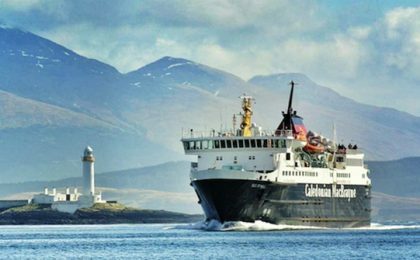 Our coach will drive aboard the ferry to Mull which is a large modern vessel with restaurant, bar, shop, lounges and viewing decks. The boat has lifts so is fully accessible. In contrast, we walk onto the small ferry plying across to Iona, an island where you need a special permit to bring a car. For Staffa, the boat gets smaller and you can expect to get wet on this fun afternoon optional excursion! We will travel in our own coach and be accompanied by experienced McCabe leaders and staff. On Iona we will meet members of the Iona community and offer two programmes, one involving more walking than the other. A highlight will be a service in Iona Abbey itself. Accommodation on Iona itself is limited so we have created a programme bringing together a real flavour of the Hebrides with the focus firmly fixed on Iona and its unique history. Iona is a tiny and beautiful Hebridean island off the west coast of Scotland, cradle of Christianity in Scotland. 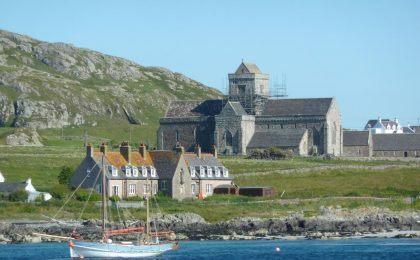 In 563AD, the Irish monk Columba (Columkille) established a monastic settlement, evangelising large parts of Scotland and the north of England and Iona became an important centre of European Christianity. 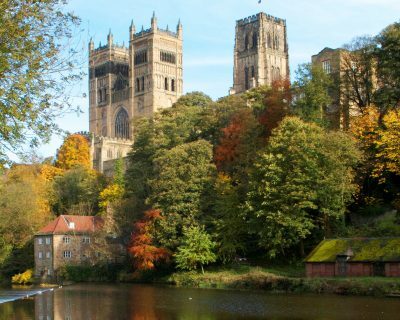 In the Middle Ages it became the site of a Benedictine abbey, and over the centuries it has attracted many thousands of people on their own pilgrim journeys. The Iona Community was founded in 1938 by George MacLeod, minister, visionary and prophetic witness for peace, in the context of the poverty and despair of the Depression. From a dockland parish in Glasgow, he took unemployed skilled craftsmen and young trainee clergy to Iona to rebuild both the monastic quarters of the mediaeval abbey and the common life by working and living together, sharing skills and effort as well as joys and achievement. That original task became a sign of hopeful rebuilding of community in Scotland and beyond. The experience shaped – and continues to shape – the practice and principles of the Iona Community. As an aside, Ursula MacLeod, George’s cousin, was a founder member of McCabe Pilgrimages. Today, Iona remains a centre for pilgrimage and the daily services of the Iona Community are open to all. There is a year-round population of over 100; long-established island families as well as more recent arrivals, including those who work for the Iona Community as staff or volunteers. The abbey itself is now managed by Historic Scotland but the Iona Community remains in residence as a living, worshipping presence. The islanders, the Iona Community and Historic Scotland work together to maintain Iona as a place of welcome.